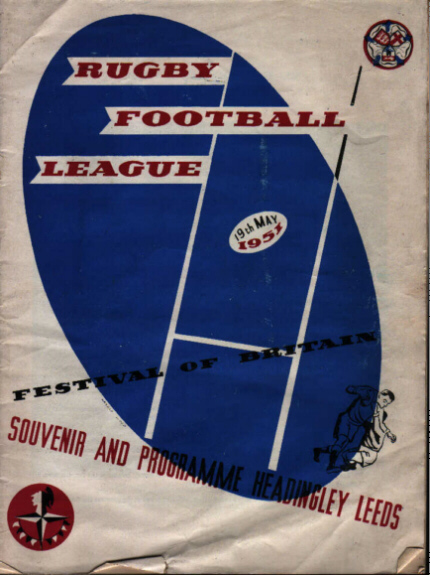 The Programme from the Rugby League International Contest between Great Britain and Australasia held at Headingley in 1951 to celebrate the Festival of Britain. The Great Britain Side as printed in the programme was, J Evans (Hunslet), A Turnbull (Leeds), E Ward (Bradford), E Ashcroft, G Ratcliffe, J Cunliffe (all Wigan), S Pepperell (Workington), K Gee (Wigan), F H Osmond (Swinton), J Booth (Wakefield), N Silcock (Wigan), G Parsons (St Helens) & D Valentine (Huddersfield). The Australasian team was made up of players based in England and included B Bevan (Warrington) and A Clues (Leeds).